RTAK II User Opinions Wanted. Discussion in 'Ontario Knife Company' started by BMCGear, Jun 16, 2017. Never had a RTAK but I've owned an Junglas for a brief period. I liked it but always felt it needed a choil. The RTAK has that and 5160 steel which I like. What are your opinions of the knife? Is there anything you would recommend over it? Pics and experience are appreciated! RTAK 2 is a very tough chopper. Balance feels like a giant brick, so other than chopping wood, it's not much good for anything else. I use it to clean up nuisance trees and shrubs in my yard. The 5160 steel seems to lose its sharpness pretty quickly, but it's so tough, it never chips. Handle seems to feel best when wearing leather work gloves. The Kabar BK9 in 1095 steel is a better all round user knife, but it's not nearly as tough. I chipped the edge in several places on my BK9 when I accidentally hit a nail while breaking down some used lumber. I don't think that would've happened with my RTAK2, but of course can't say for sure since I haven't hit any nails with it yet. Bottom line, if you want a tough knife for heavy wood processing, RTAK2 is a very good choice. My only complaint with rtak 2 is the handle is way too thick and boxy without any hint of contoured ergos. Mark McKenzie and oxman198 like this. I own the rtak2 and the bk9, never tried the junglas tho. The rtak2 does have that thin tip, but 5160 is supposed to be the best all around chopper steel, but the edge holding of the bk9 is better hands down, not to mention the ergonomics and if you know where to look a decent leather sheath for it can be found for around $20. I love them both, and if I could I would take them both with me and carry lighter 3-5" blades to make up for the extra weight. I think the only other option would be a well Ht'd chopper in 12c27. The gold rush bowie by bear and son has never let me down, if you can get one that isn't ground too thin. I believe the knife designer said the choil was not meant to be a true finger choil but more of a sharpening choil—I could be mistaken. I am curious to try the junglas myself, mainly to find out if rowen’s heat treat makes their 1095 as flexible as Ontario’s 5160. No doubt it will hold an edge longer, and the high saber grind has my attention. (for strength and chopping ability). Plus it comes with a kydex sheath, making it cheaper or about the same price as the bk9 after the upgrades. i do not like the balance point of my rtak2 , and sold it. From only a sheer speculation a few things to note. The Esse has a nice high saber grind that is gooder for batoning and such and the steel has a good heat treat that makes the 1095 a great performer. According to the readings I read on it and U-Tubing tube stuff. The OKC is FFG but has a 5160 blade that is heat treated well and my experience with OKCs 5160 is unless its a fluke in the blade, it is very freaking tough and near indestructible. So it would be the personal preference I guess. Oh cost might be a factor, but I don't think either would disappoint. And Both have great warranties. Editcus: I'll be able to comment on the RTAKII once I get mine. Own and love both the RTAK II in 1095 and Junglas, but I like the boxy scales on the RTAK a little better than the rounded edges on the Junglas, they seem to fill the hand better, keep the knife from rotating, and help spread any shock from chopping. I'm also a fan of the RTAK's choil; seems ESEE kept the choil on the 6 but dispensed with it on the Junglas. It looks like I’m gonna have to do a lot of chopping this spring. Especially if the nor’easter coming thru tonight takes down more trees. Along with a chainsaw, I’ll bring my rtak2, my 18” tramontina, and one of my 13” busse bolos. I still don’t have an Ontario 18”machete, I’m not sure why though! For the $5 more it costs than the tramontina, it seems like it would stay sharp a lot longer. Of these, the one I’ll use the most will be the rtak2, unless reach is an issue. I'll just steal my brother's chainsaw, brush saw and use an axe, pickeroon, and the SP-53 for clearing. The RTAC II will be brought for the more new spring twiggy alder brush. For note I mostly got black spruce and alder brush and some poplar mostly. My dad wonders who keeps clearing the trails at his farm, guess my brother never told him I gave him one of my SP-53 as he uses that thing for every thing mostly. He says he likes the fast touch up that is all that's needed with it, guess that's the 5160. He found the RD Tanto I gave him is a great heavy middling sized swacker and hacker and dang hard use knife it is, I think its tougher than a Becker 2 due to no skelitalized handle the RD Tanto don't have. Still forgot to ask him what he uses the SP-10 for but he modded the sheath for a shoulder carry but I saw by the marks he uses it a lot as well.. The reason I gave him some of my "Reserve Stock Pile!" was because I knew he needed them more than I did and he finds more ways to use them. Thanks for the pic alaska77. I wear an XL glove and for whatever reason I don't mind the scales on my ESEE 6. If I am fine with the squarish grip on the 6 is the RTAK2 similar enough to feel the same ? I've seen my junglas bend pretty good when batoning through some dry knotty wood. It was kind of surprising to see it take such a crooked angle, then snap right back to arrow straight. I did take a few chips on the junglas after chopping some very hard wood, but they were small enough to touch up with a stone. Also, I have maybe 4 XL hands, and the Junglas is very comfortable. I wouldn't mind checking out the rtak 2, but it's so similar to the junglas that i might rather get my hands on a condor parang or kukri or something a little different. I was thinking a Junglasthingy, but having a few BK9s with micrata already for me would make it a bit redundant. The RTAKII I find is great for them green twiggy branches clearing out deer shooting lanes...er nature viewing lanes...and shooting...with um...a camera yeah that's it! But the RTAKII still can go through some of the heavier stuff when needed easily. I'd like to see a high saber grind on the RTAKII but the 5160 steel makes it pretty dang tough. 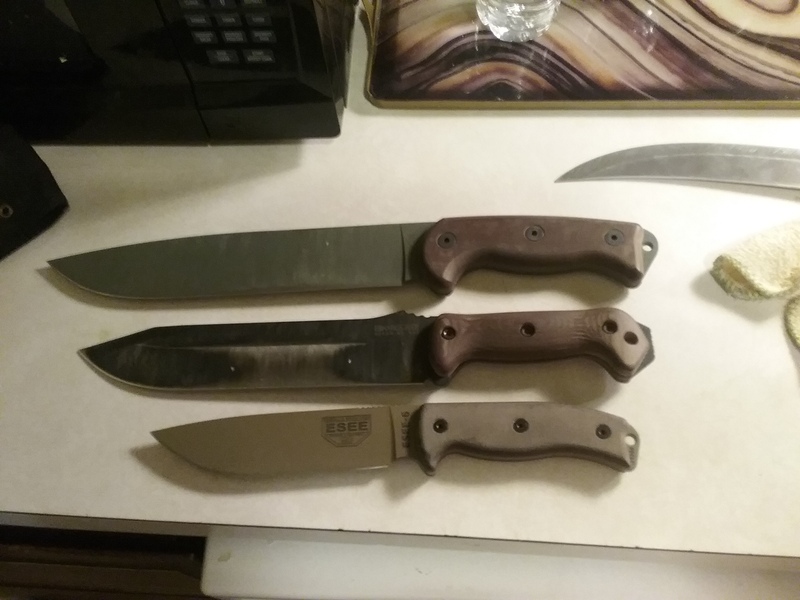 I picked up one of the 5160 RTAKII a while ago.Still haven't used mine since I purchased it because of the large block handles which are really not too ergonomic but I been thinking of getting some G10 one from TheKnifeConnection.I was just wondering if anyone has purchased these for their knife.They also have G10 handle sets for beckers,esse, and other Ontario.